After landing, you will be welcomed by an 82-foot-tall digital wall greeting arriving passengers with video and welcome messages in their native languages. Before taking off, you will face a 23-foot high digital display offering videos of Los Angeles culture. If you stand in the terminal's Great Hall, check out the Time Tower, the 72-foot-tall four-sided digital media structure wrapped around the elevator, or the Story Board, a 120-foot-array of eight digital displays visible from multiple points – both have been designed to serve as a canvas for ambient narratives. If you walk around, you will also pass along the Portals, a series of ten 28-foot-tall stacked LCDs, interactively programmed to react to passengers’ movements. I was impressed by how these simple TV screens could be transformed into a kinetic sculpture – a form that I had not seen before. The Story Board (top middle) and the Time tower (right) digital displays showing blue ambient contents at The Tom Bradley International Terminal at LAX. 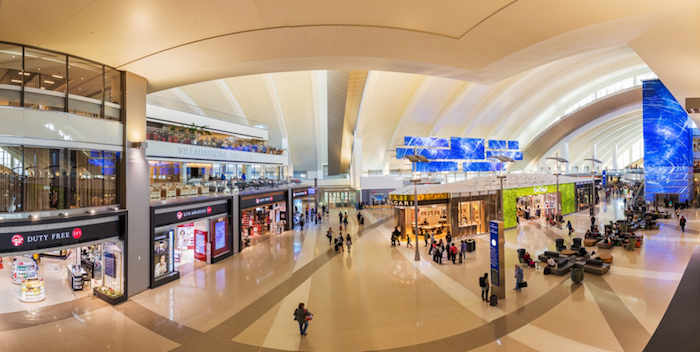 The Tom Bradley International Terminal illustrates how digital signage is evolving from advertising to creating stylish and captivating customer experiences through innovative use of display technology and content. The terminal installations also highlight the challenges this shift poses for different display technologies. Most of the features that are viewed from a long range use LED screens, where each pixel is made of a discrete LED on a pitch of several millimeters. Those viewed at shorter distances, in the case of the Portals, use LCDs, because the pixel pitch is beyond the capability of LEDs today. For example, LED screens with a 6mm LED pitch are commonly used for very large area installations, but they need to be viewed at a distance of 12 meters or more for the image to be perceived as uniform. Any closer than this, and the image will appear pixelated to the human eye. LCD remains the technology of choice for applications requiring high pixel density and closer viewing distance. With a typical pixel pitch of around 0.6mm or even less, viewing distance can be reduced to less than one meter giving the ability to build more interactive or high-information content. With brightness ratings as high as 7,000 nits, high brightness LCDs can even shine bright in direct sunlight making them the ideal solution for outdoor enclosures, semi-outdoor and in-window applications. On the other hand, the maximum area for LCD screens today is less than 100 inches diagonal, though they can be tiled together for some applications (with a small seam in between). According to Grand View Market Research, the digital signage market will nearly double by 2025 mostly due to increasing demand in the retail sector. With more and more screens in all aspects of our lives, how can we avoid them becoming too bothersome? How can we create a seamless experience for the customer? While LED displays are great for use when you need to capture customers’ attention from afar, even around curved surfaces (examples include Piccadilly Circus in London and The Runway pillar installation in Doha), the higher pixel densities of LCD are better for up-close or high information displays. However, LCDs today are built on glass, which severely limits their ability to flex and conform to surfaces, as well as making them heavy and fragile. A new kind of LCD has recently been developed that will remove these constraints. FlexEnable has developed Organic LCDs (OLCD) on plastic substrates – making them thinner, conformable to surfaces, and shapeable (easily cut into unusual shapes and curves), while still being able to achieve the same high pixel densities as glass LCDs. OLCD completely changes where and how displays can be used and deployed for digital signage. 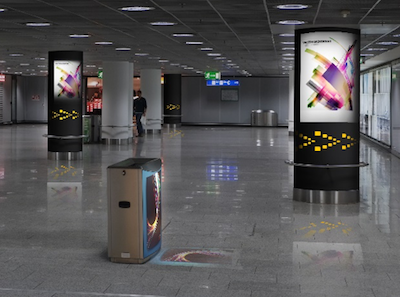 For example, OLCD allows digital advertising displays to be wrapped directly around pillars in building such as airports, blending into their surroundings. OLCD enables displays to take on an organic shape and create an inspiring environment. OLCD can achieve the same performance as existing digital signage LCD screens, but on plastic, to provide a mechanically robust but lightweight solution for reliable digital signage systems that are easy to integrate. Plastic OLCDs are currently being transferred into mass production by FlexEnable at its first license Truly Semiconductors. The manufacturing process has been developed to be highly compatible with existing capital equipment used for standard glass LCDs. It also uses much of the existing materials supply chain making OLCD the lowest cost route to produce plastic displays. Digital signage has been reshaping the urban environment progressively over the years and we are standing on the verge of another revolution that will completely redefine where and how displays can be used in our surroundings. Learn more at info@flexenable.com.